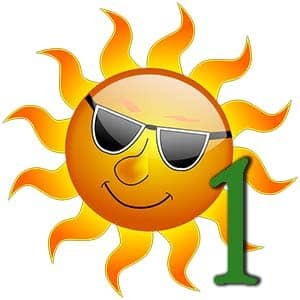 Number 1 as a birthday number is generally associated with Sun. It is the basis of everything, the leader of the numbers. That's why you can often see this number as the head of numbers' family. People who have birthday on this day are very original, with vivid imagination and cheerful disposition. They are purposeful and persuasive. They like freedom and hate any sort of limitations. People like this know exactly what they do, and don't need any advices. People with number 1 are usually independent workers: they manage to work without or with minimal supervision. Number 1 people are very self-confident and demanding. They obtain really strong power of will and belief in ideas that sometimes they may be viewed as obstinate. A child with this number will be hyperactive and won't find a rest until his or her wish is realized. So if such a child is not taught how to get desirable thing independently, he or she can act up for a really long time. People under this number can achieve great results in career and can be truly happy in romantic relationships, especially if they are tightly connected with their family. As for the emotional side of number 1, it is important to remember that they are inborn leaders, and it works for everything. They will use every chance to become a leader. It has some consequences for such people in their romantic relationships. They will likely lead in relationships, if the desirable partner is hard to achieve - number 1 will make everything to change such situation, or finally loose any interest. Usually they fall for interesting and extraordinary people. They aren't afraid to be rejected, as it won't affect their self-esteem: number 1 always stays number 1. In most case people aren't able to resist the charisma and charm of number 1. People, who fell in love with this number person should always keep in mind that this number is associated with perfection, they are demanding to themselves, as well as to other people, and such expectations are really hard to meet. Also, their partners should be in perfect physical fit. If you are a number 1 person, you are probably intelligent, witty, physically strong person with impressive power of will. You like interesting concepts and can motivate others. It is the reason why your charm works almost on everyone and everywhere. You are very ambitious and demanding, but you should remember that people around are not that active and skilful. You are a leader, so lead people by your example. Never set enormous demands, as people have different vision on everything.